We have a not-so-secret obsession with all things bone inlay. 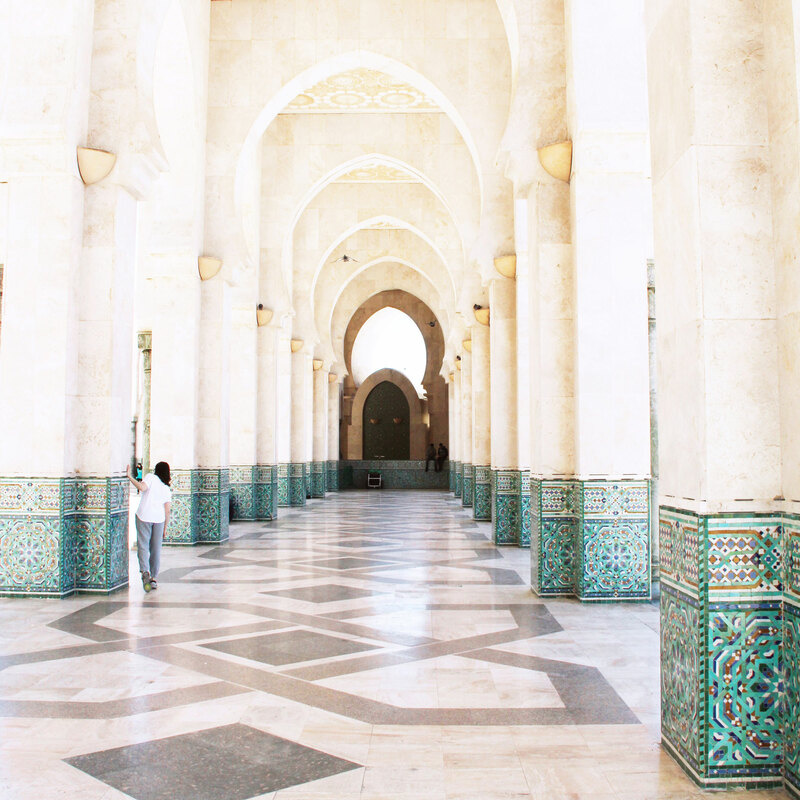 The graphic color contrast, the gorgeously intricate patterns, and the ability of being able to use this technique on anything that’s practical makes us get all heart eyes. Every. Single. Time. 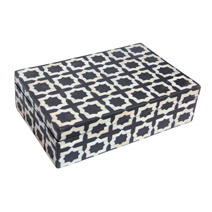 Seriously – if we could bone inlay everything in our homes we might just do it! 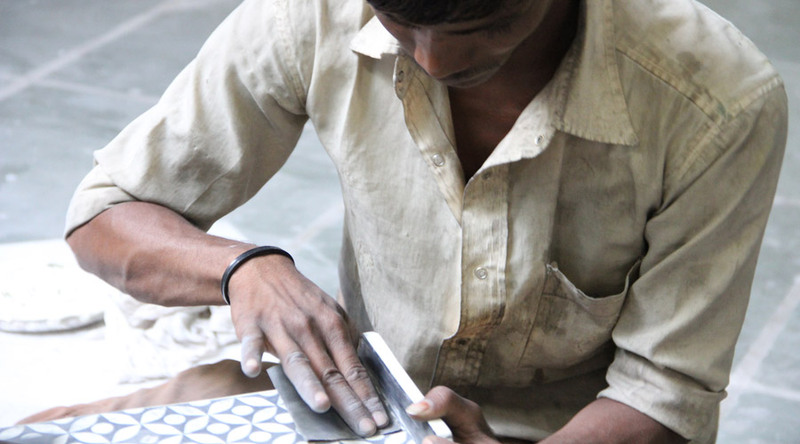 Our bone inlay partners are a family owned workshop of master artisans in Rajasthan, India. On our last trip there, they graciously hosted us at their studio and gave us a full tour. We were amazed to watch the artisans at their craft. 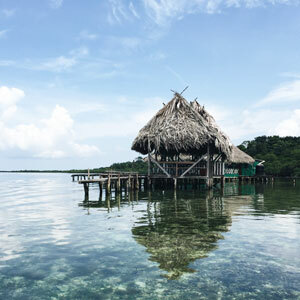 To create a single bone inlay box, each artisan had a specific role that has been passed down through multiple generations. 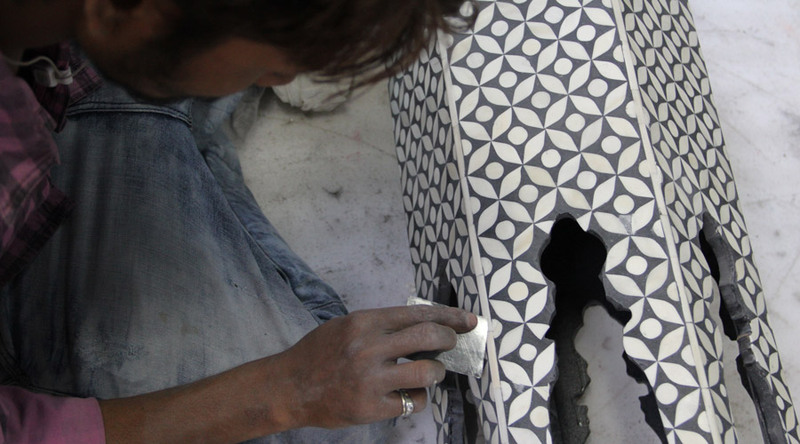 Together as a team, they follow a meticulous and detailed process that takes about a month (and sometimes more!) to complete. To begin, a small team of artisans are responsible for carving pieces of bone into delicate silhouettes. 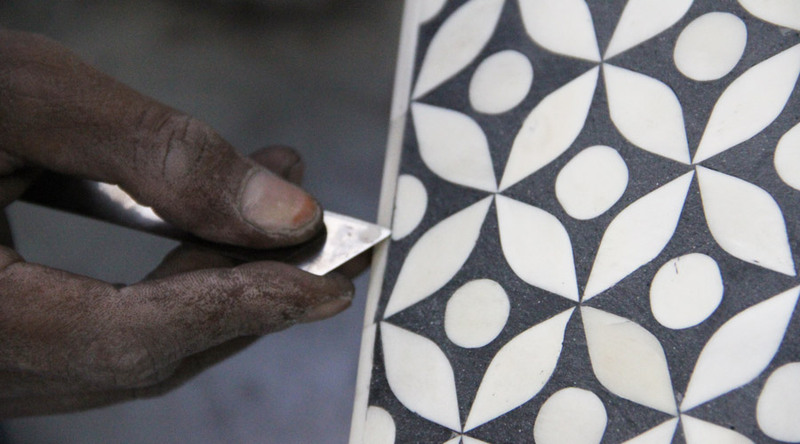 Using simple tools, they carve each piece into leaves or petals for our traditional botanical pattern boxes, or into geometric shapes for our Moroccan tile box. An artisan carves a delicate piece of bone into a small shape. 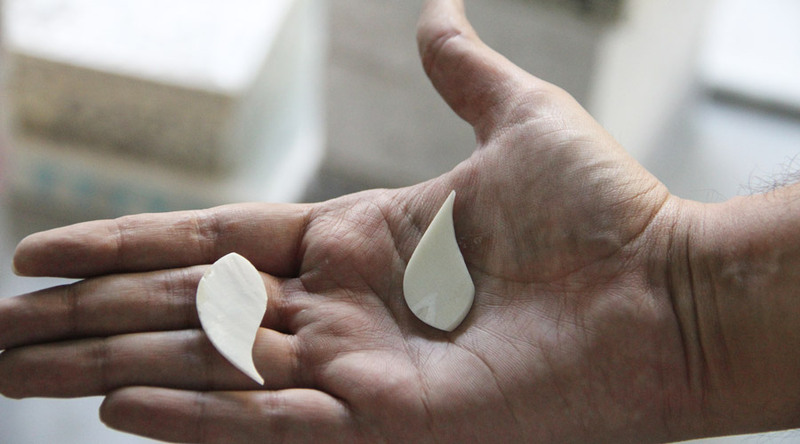 Our artisan partner shows us two pieces that were just carved into a leaf shape. 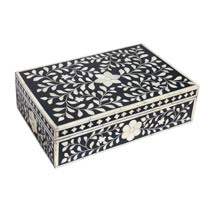 Another artisan is responsible for affixing those carved pieces onto a wooden frame in the intricate pattern featured on the box. After the pattern placement is complete, yet another artisan specializes in filling the outline of the pattern with colored resin. This resin completes the background and creates the stunning contrast between the graphic pattern and surrounding surface. To finish each box, artisans sand and seal it before it is ready to ship. This artisan completes a side table featuring a pretty pink resin background. 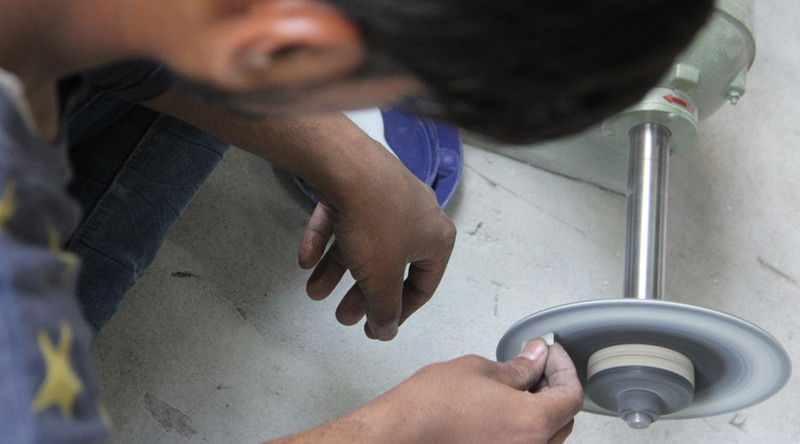 Sealing and finishing the surface is a long and detailed process. The edges are sometimes the most difficult part to complete as they require a meticulous attention to detail. A closeup of some of the finishing touches before the piece is sanded and sealed. 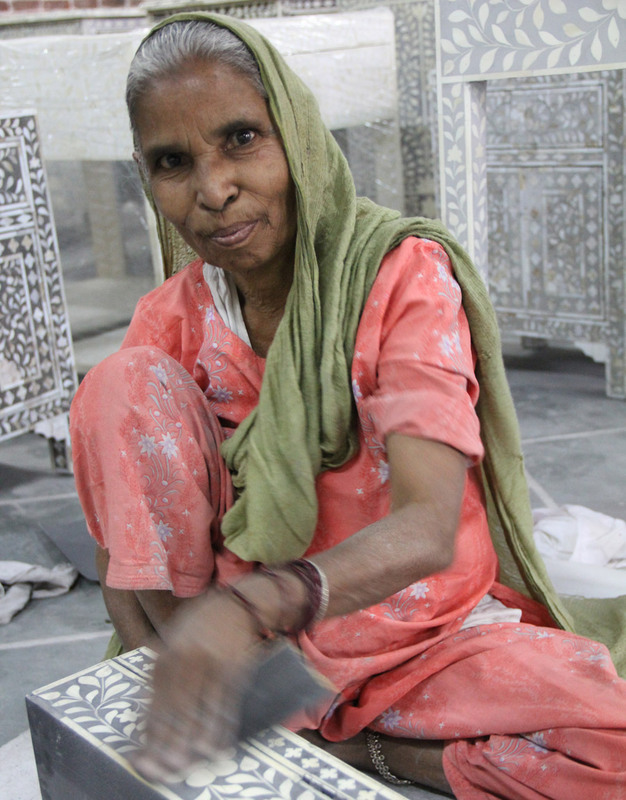 This artisan completes some final sanding near the end of the box making process. 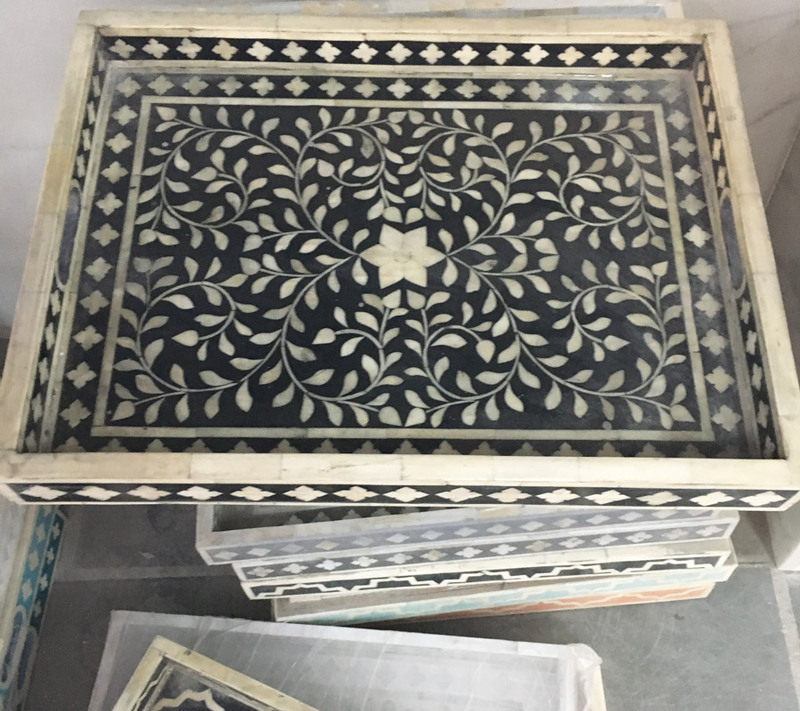 A stack of gorgeous bone inlay trays are ready to be cleaned and shipped. 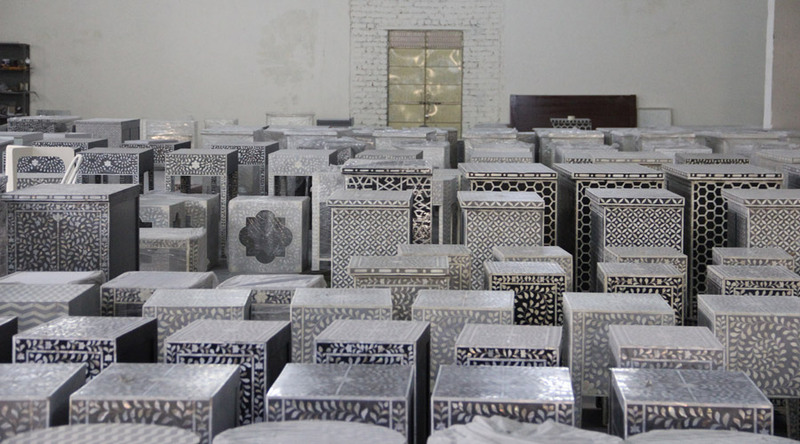 So many bone inlay side tables! 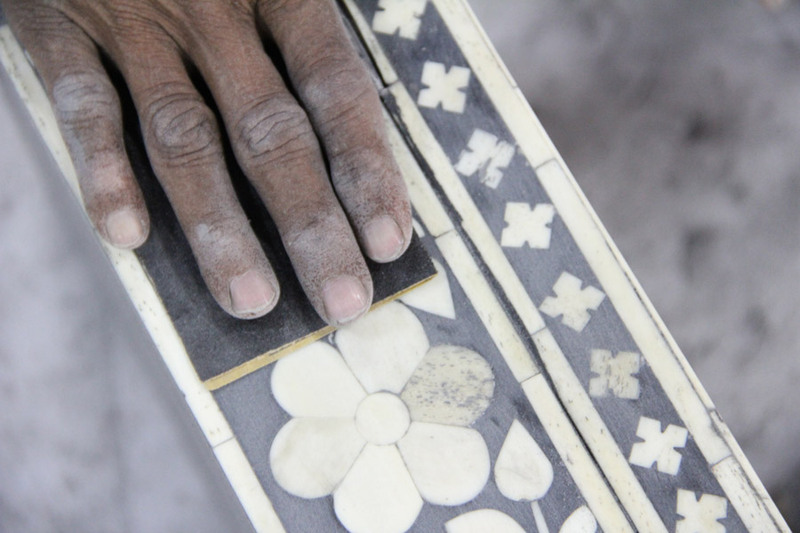 While we may have had a crush on bone inlay pieces for a while, seeing the artisans in action and getting a glimpse into their incredible detailed technique made us fall head over heels. 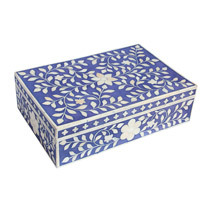 Since every box is made entirely by hand, each one is slightly unique and special, bearing the marks of its makers in every detail. Do you love bone inlay as much as we do? Comment below to tell us what objects you would like to see using this technique next!